Not surprisingly, thousands and thousands of businesses around the country have crunched the numbers and taken the plunge, installing solar panels on their rooftops and parking lots. Photovoltaic panels need their space, a lot of it. So even the most enthusiastic facilities teams will run out of rooftop long before they’ve made a significant dent in their power consumption. Take, for example, the recently announced project to be built atop the Mandalay Bay Casino and Resort in Las Vegas. 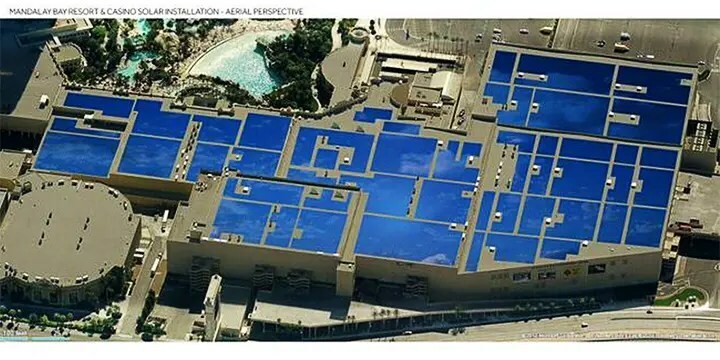 At 20 acres, the Mandalay Bay has a very, very large roof and the whole thing will soon be blanketed with solar panels (the artist rendering of the project gives a good sense of its magnitude). Yet even on a midsummer’s day when the panels are producing 6.2 MW of electricity, the entire array will supply only about 20% of the Mandalay Bay’s power needs. Most of the time, they won’t do that well. What to do? Are corporate managers left without options once a successful rooftop project is complete? And what about companies with no rooftop at all? Fortunately there’s another way. Any team with the wherewithal to implement a rooftop solar project could implement a Virtual Rooftop project instead (or in addition). A Virtual Rooftop project is a new, dedicated renewable energy facility that’s located somewhere offsite. Virtual Rooftop projects share many of the implementation characteristics of a traditional rooftop project, and bring many of the same benefits. They bring new renewable energy to the grid. They’re emission-free. They have economic value. And there’s a mature industry of renewable energy project developers and advisors who can help make it happen. To be sure, there are differences as well. On the economic side, for example, offsite projects usually can’t offset “retail, as delivered” power rates. A project site needs to be arranged. On the other hand, offsite projects benefit from economies of scale and lower construction costs, and can be sited so as to optimize the renewable resource. Another helpful difference is that the installation is independent of a company’s physical facility, so the company need not be committed to their current site for the life of the project. Virtual rooftops do present one important non-economic barrier: companies that implement projects on a virtual rooftop may need to sell its electricity into the grid rather than use it directly at their site. A helpful way to break down this barrier is to recall that hosted rooftop installations do exactly the same thing, and even behind-the-meter facilities usually export power to the grid from time to time. As far as arranging for the power sale, it’s often quite straightforward; in the size-class of most offsite corporate projects, standardized power sale contracts at published rates are available, and procedures such as acquiring a grid interconnection are greatly simplified. Still, company senior management might be reluctant to entertain an offsite project. This is where the “virtual rooftop” is a powerful concept. In reality, rooftop projects are not always as simple as they seem at first, and virtual rooftops are not as difficult. Undertaking an offsite project is more similar to a rooftop project than it is different, so likening it to the familiar can help create bridge the perception gap. On the sustainability side of the house, company objectives can be met whether or not the new renewable energy flows to the company facility. Bringing new renewable energy to the grid is a net reduction in Scope 2 emissions no matter where the project’s wires are located. Company sponsors make choices about their renewable energy credits, consistent with their environmental and economic objectives, just as they would on a rooftop project: keep them, or swap them for less valuable but equally legitimate credits; or sell them. Just like rooftop solar, a virtual rooftop project isn’t right for everyone. Utility rates and rules differ, and the availability of attractive renewable resources (solar, wind, or otherwise) differs. Fortunately, that’s exactly the kind of analysis at which real estate and facilities project teams excel. Like a facility siting exercise, or an important lease, or a major building retrofit, there are many factors to consider, many economic considerations to parse. These experiences have translated well for solar rooftop implementations. Project teams understand that there are multiple financing options, that an interconnection agreement is a contract just like so many other contracts, that, in essence, a renewable project is just another capital project with a longterm benefit stream – dead-center in the core competency map of any largish company’s real estate or facilities team. TerraPass has helped companies implement “virtual rooftop” projects ranging from 2 to 100 MW in capacity, including solar, wind and hydropower technologies. For companies with much rooftop runway, it’s a great alternative to consider.